The #WCFGneevaWeek of events dedicated to the global communication industry registered participants from 30 countries all over the world, including first-time comers from: Israel, Barbados, Kenya, South Sudan, and Australia! The event provoked intensive discussions, eliciting the rational of today’s social media impact and its crucial role as a public-opinion-maker, offering practical solutions for handling fake news and media manipulation, also touching on key strategies for successful country branding and building a political reputation, as well as sharing insight on valuable digital moves to leverage CSR campaigns, and the role of Artificial Intelligence and Virtual Reality on the future of business and humanity. The forum had 5 major supporters, 9 media partners, 10 exclusive partner-agencies and a number of large professional associations > To ALL PARTNERS 2017 - Thank you! Trending #1, with huge Twitter outreach! 990 000 Twitter accounts reached! 6 790 000 impressions on Twitter! WCF’s news got reflected in Italy, Russia, the USA, India, Bosnia and Herzegovina, South Africa, Brazil, and Australia. • You or your company's reputation is EVERYTHING! Don't allow others to do the speaking for you! • CEOs who refuse to spend on social media/crisis strategy are at peril: 24/7 monitoring is required! • Clients expect consultants to act as decision-makers. Quick SM response in the middle of the night. • A drastic change in the past 4 months: now communications wag the tail of diplomacy. • Fake news is a danger to democracy and provokes hate speech. FB has failed to combat that. • No one sees Europe as the shining example of integration. Populism and isolationism is on the rise. • "Information is the new fast food! "; Today, we consume 87% more information than 30 years ago. • Mainstream media play a crucial role in transmitting and contextualizing impactful stories from a crisis: a strong relationship with journalists is a key factor of getting a story out! • VR and AI continue to grow their market share, yet: production is still expensive. • 3 very real AI threats: fall into terrorists' hands; violate privacy; have a HUGE impact on employment. 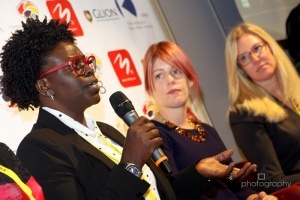 Check out Louise Nealon's personal impressions as an Australian expert! Great Coverage also by Pranbihanga Borpuzari from Economictimes-India! › Need for active social media and community management - in 2016, WhatsApp + FB messenger audience increased by 400 million users (~ Olga Podoinitsyna's presentation). › Savvy use of tools for measurement of Brand Awareness. › Extensive use of global, regional or international events as vehicles of Nation Brand promotion. › Constant feed for target audiences: new data, curious facts, tourist attractions info. › Creating a story of the country brand that provokes the recipients‘ empathy. › Word-wars: EU democracy’s basic advantages – integration and equal human rights, are at stake. › Global communicators need to use Digital Diplomacy to find a common ground for fighting terrorism and fake news. › We should verbalize public messages carefully, with clarity and authenticity, and avoid provoking hatred or antagonism. › "Europe's problems are not caused by Trump's tweets, they are home-grown. We must overcome the divisiveness!" said Daniel Holtgen, Spokesperson of the Secretary General at the Council of Europe. › "What's happening now in relation to the Turkey VS Europe tension is damaging today's public diplomacy," said Jennifer Stapper, Chief of Comms at UN Volunteers. › Public diplomacy in human rights should be a value-based dialogue between authorities and civil society within and across borders to promote social harmony based on justice, equality and peace. › Politicization of human rights and the selective application of relevant international law norms give rise to skepticism. › Public diplomacy, when used uniformly and in good faith, has the potential to advance the realization of human rights. › WCF's first-ever all-female panel on global communication, with six experts from the USA, Australia, Kenya and Russia, moderated by Dr. Kara Alaimo, Asst. Professor of Public Relations at Hofstra University. › Key focus: under what circumstances brands can benefit from a consistent global identity and if they are better off developing a relevant message and strategy for different countries and cultures. › The panel also featured the biggest cultural differences to be taken into account when adapting communication strategies for various societies and audiences and touched on the workplace practices in leading global teams comprised of colleagues with different expectations. › Finally, the panelists discussed examples of organizations with a successful cultural approach to their communication campaigns, as well as any such that worked poorly, as is the case with the "Share A Coke" campaign. › "Debilitating, ongoing conflict in Sudan. The human cost is huge. Where is the African and the world's leadership?" ~ tweeted by Solly Moeng, GM of Don Valley (South Africa). › The heartbreaking story of South Sudan: 5.5 million south Sudanese will die of famine by the middle of 2017, if something doesn't change. › Each and everyone of us has influence and can be a Media today – this should be used to attract attention of governments and involve the Silicon Valley in due action on world's problems! › Kara Alaimo revealed how President Trump made full use of the social media to win the election. She also advised communication practitioners how to prepare for and respond to new and heightened challenges in the post-US-2016 presidential election era, such as fake news, Twitter attacks by President Trump, expectations for businesses to weigh in on political issues, and public critiques by employees and endorsers. › Elianne Ramos rendered a memorable and gripping presentation about the misplacing the focus of Clinton’s campaign – stress on policy, rather than intensifying the emotional value and tweeting more intensively and aggressively (like President Trump). She mentioned the threat of fake news in political elections and pointed out how Clinton apologized by tweeting „Sorry, America!“. Statistically, votes for Trump were a higher number, yet the Head of the Hispanic SM Campaign for Clinton asks: who actually won, considering today’s global situation? › One tweet by Victoria Knight‏ @VK_social sums it up: "President @realDonaldTrump won the #Election2016 because he outsmarted his rivals on social media ~@karaalaimo"
› Unbelievably strong impact of the Social Media – today, more than ever, you can voice a cause and make a difference! › "Voice of your staff is more influential than ever. Set the example from the top to encourage Employee Advocacy," said Gisella Lomax, Head of the SM Unit at UNCHR, the UN Refugee Agency in Geneva. › One slide by Franky Saegerman, Head of Digital Insights at NATO Public Diplomacy summed it up: Wanna know how to engage the globe? Just see how @realDonaldTrump changed the game. › The key word is empathy – once having touched the emotions of the electorate, a campaign’s success is guaranteed. › Again – incredible power of the social media! › Elections will never be the same again: forget about pragmatic or rational, reach out to gain the hearts of the people. › Emotional political leaders: the trend now, as opposed to rational and pragmatic leaders. "The more emotional & less rational a politician, the more successful they will be." (~ Evgeniya Bliznyuk's presentation). › 3.9 billion of people unconnected to the internet are disproportionately female, rural, poor, illiterate, or elderly. › Aflac has donated 3 million to research & treatment into pediatric cancer Wow! › 85% of the investors surveyed by Aflac only want to talk to companies whose CSR is authentic. › Only 4% of federal cancer funds in USA goes to childhood cancer. › The Egyptian government has developed a targeted campaign to address its tourism issues. › Today's brands need to humanize themselves. Social media numbers are fine but engagement is more important. › Think about sustainability as your core, not as a side function. › CSR is an essential part of an organisation's culture, not just linked to profitability. › CSR is a licence to operate in communities where you are socially relevant. › Digital CSR is the corporate wonder weapon to inform, inspire and impact the world. › The rationale behind non-cash currencies and how this can change the world we live in. › Digitized cash, replacing actual eMoney for banked users, improving the 'cash experience' for both banked & un-banked users. › Fake News on the rise, as people trade trust in established news for what family+friends share on social media! › Americans trust in mass media eroded down to 32% (Sep 2016). › Fake News are not something new, but now they are being industrialized. › VR has huge potential markets - $ 80 billion by 2025, yet, many tech limitations to adoption still remain. › Science plays an increasingly big role in communications. What are the implications for practitioners? › Culture + Environment + Opportunity. That's how you support entrepreneurship in emerging markets. • Communication has been redefined and given new meaning, referring increasingly to the technological revolution of the late twentieth century. By renegotiating the meaning of communication, we have also successfully renamed our own identity as a society – a global culture – managed by these technological innovations. • Mainstreaming of globalization, which suggests an increasingly global scope of political, economic and social activity. Globalization swings between promoting a global homogeneity, and promoting a heterogeneity that challenges identity within the global community and the belief in a single global culture. Globalization is a by-product of the technological revolution that created modern forms of communication. • To identify future issues concerning communication, one must accept a symbiotic relationship between communication and globalization, realizing that one is symptomatic of the other. • The forms of media and communication provide the system that links the components of our national and increasingly global political, economic, and social systems. - Globalization of our information environment as we experience a flatter world in which one-way communication is increasingly replaced by multi-directional transmission ; in which the North is not always the source and the South always the receiver. - High stakes involved in struggles over ownership of the new media, as well as the resistance to the even greater consolidation of ownership over old and new technologies. - A crisis in journalism brought about by the collapse of the economic model of commercially supported news enterprises wedded to an outmoded production and distribution system, as well as the upheaval wrought by parties formerly knows as the audience taking partial control over the means of production and dissemination of information. - Epochal shifts in our information environment as we learn, both for better and worse, to live with technologies that provide opportunities and challenges unimaginable until recently outside the confines of science-fiction – and more are on their way. • In these and many other similar trans-formative challenges, communication professionals have the opportunity to draw upon a wealth of disparate theoretical and empirical strands to clarify questions of real societal impact, illuminate complex realities, and help explore solutions to pressing problems. • WCF members, individually and collectively, need to assert our centrality to any cogent and credible account of the central role of communication in our contemporary world. 7th annual edition of the prestigious C4F Awards! "The Forum in Geneva collected many communication specialists from all around the world. The event has developed with the time into a platform to go beyond local borders and talk about global communication with the participation of a diversity of the related counteracting parties. This has not happened accidentally, but because the WCFA association is the only organization of communication professionals in the world that fights to increase the influence of communication on the development of the world and goes beyond the classical service model of interaction with business, public institutions or politics".